I found, mostly by accident, a site telling me how British I am. I used the link from point 10 at the end of writing and I’m told it, the questionnaire, has been ‘deleted from the server’. Perhaps someone with China-sized power complained. Every culture has its unique characteristics. Spain has bull fights, Italy has its famous pasta and pizza dishes and Britain has hob-nobs and milky tea. Venture inside the mind of the average Brit and you will also find many identifying thoughts and feelings common to you as well. Humdrum they may seem, but they are no less a part of our nation's collective psyche than our stiff upper lips and even tempers. #16 "I'm not sure if England is a country"
This, I almost agree with. I am British and I decline to call myself English. I’d rather say I’m from the NE or the SW or both, a Geordie or “Cornesh” – when no-one in either place would agree. England is not inside London, but I’m not certain London lies inside England any more either. #15 "I smiled and apologised when returning a bad meal. Then I tipped the waiter"
No I don’t, I don’t do tipping, a practice I am unable to understand. There’s a price in return for a value; if value is not received, the experience will not be repeated. I haven’t returned a bad meal either; I just never went back. #14 "I feel compelled to ask taxi men about their work schedule"
No I don’t, I don’t talk with taxi drivers. I don’t listen, either. I might well observe the driving and the traffic (they’re different) with interest. Several reasons not to talk with them: my Chinese is far too bad, I’m not interested and I’d rather they ‘concentrated’ on driving. In Britain, I can’t afford a taxi. #13 "My voice gets posher and more robotic when I talk to foreign people"
No it doesn’t. I do try to speak more slowly and I try not to say ‘me’ when I mean ‘my’. I’m never posher, nor even more posh. I am often congratulated on clarity of speech, though my word speed remains otherwise too high. I work with English as a foreign language and I am well aware of the comfort of lapsing into ordinary tones, which tends to include rather more swearing than would be acceptable at work in Britain. #12 "I’m really hungry but when I’m offered something to eat I’ll politely refuse." No I don’t. Yes, I’m almost always hungry. I rarely refuse food at mealtimes, though I’m likely to decline food between mealtimes. I doubt that I’m particularly polite, since I don’t use phatic language (where you say things you don’t mean because they’re the polite thing to do). #11 "Every summer I think - 'maybe I'll play a game of tennis.' I never do." No I don’t. I play tennis rarely. I’d rather play squash, where I don’t have to spend ages looking for the ball, where I can see the ball far more easily and where the idea that play shall be continuous is a positive advantage. #10 "It doesn’t really matter if I fib to the doctor and dentist about my lifestyle." No I don’t. I go to see a doctor for an opinion; giving him or her bad answers is not going to give me useful responses. There’s an implication in this No10 that the doctor is asking questions that the respondent wishes to avoid answering. Why is that? I think the answers are to do with either self-deceit or, almost the opposite, recognising that much of the lifestyle is to be deplored. Why then feel guilty? These are choices we make, are they not? if you’re not going to listen to the doctor, then why are you there? #9 "I always sound like I’m taking the Mickey when I say 'great." No I don’t, except when I want it to. #8 "Men aren't allowed drink wine in pubs"
Now this I recognise. 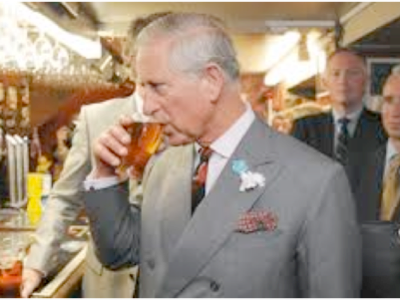 And a nice pic of the Duke of Cornwall. I’m reluctant to have non-alcoholic (drink) in a pub, too. So much so that I’ll avoid a pub when driving. I do not claim to understand this, and I have tried to make use of a pub as a place to be fed at lunchtime, but I feel somehow required to order a beer, and a half is emasculatory, somehow. I have asked for, and drank (drunk? drinked?) a non-alcoholic beer such as that recommended by Billy Connolly (Kaliber). I think I’ve drunk whisky at PMC and the Kyle of Lochalsh - only. I don’t think I’ve ever drunk wine in a pub. The same comment applies to places outside Britain that might be pubs, too. When in restaurants, yes wine is preferred, but even those inside pubs have caused me to drink beer. Now isn’t that odd? #7 "It doesn't matter how cold it is - if it's sunny it's barbecue weather"
No it isn’t. It’s barbecue weather in a Chinese summer if someone else wants to cook. It’s Barbie weather in Oz when Barbie wants her swimsuit on, or in NZ when it’s not raining. It is almost never BBQ weather in Britain, though there were occasions in Cornwall where it was almost appropriate. The trouble is that things cook better in the oven. If you like your food burnt or burned this is fine. I prefer it to be evenly thoroughly cooked, or just flamed enough to be sealed. #6 "I don't believe in superstitions but I'm still not going to walk under that ladder"
I don’t, and I do. Walk under the ladder, that is. I’ll look for the cat only from amusement. Brits walk under seagulls, which is probably more likely to result in bad luck. I have due regard for fireworks in China, which are meant to chase away the foreign devils, but most of us are still here. #5 "I consider people who take sugar in their tea to be lesser than myself"
No I don’t. I have sugar in my tea because the tea is instant and white and already sugared. Drinking tea in Britain, I’ll have sugar or not depending upon the whim of the moment, probably less than a spoonful. Chinese non-instant tea is often improved with a little honey or crystal sugar. It would be greatly improved by using cups big enough to hold with a hand, not two fingers. #4 "I only ever have 'quiet' Christmases"
True. That is my choice. Partly this is because I live in China, but there would be ways of having a rowdy Christmas. I prefer to ignore it altogether and of seven in China I have spent five of them at work. #3 "I say 'thank-you' at least a dozen times during a single credit card transaction"
No I don’t. Perhaps twice. The POS operator might also, but in China it is quite likely there is no conversation at all, until I get my card back, when I’ll say xiexie. #2 "I always think we can win at sports, but we never do"
No I don’t. I hope we acquit ourselves honourably. On average I’d expect a fair competition to end up about half wins and half losses. Who is ‘we’, here? The Brits? Then I’ll support athletics, rowing, cycling and rugby, but I’ll support any or all of these; better sport, evidence of skill, thought and preparation, far more. I really like that a rugby crowd will applaud good play by either side. The honesty here is that the crowd has come to watch the sport be played, not only come to see their lot win. I find my few American friends differ. #1 "I'll tut and head-shake but will avoid confrontation like the plague"
No I don’t. I often confront directly (now). I’ll admit to having to work up to it with some people, but I find that looking (being, feeling, being treated as) older allows one to make comment about a situation. This can sound like confrontation but there is a subtle difference (for some) between confronting a situation and a person. There’s little benefit in confronting people, who will go defensive or aggressive but neither response will progress the situation. Confronting a situation can put the people involved on the same side, against what has happened, and this does move things along. Conclusion: I score two and a half out of sixteen, nos 4 and 8 and perhaps 16, all powers of two. Ergo, by this measure I am no longer British. But perhaps Binary. I don’t complain about the weather, though I will moan about the pollution level depriving me of opportunity to exercise. it was my choice to live here and I will move if the AQI levels stay high for long. What my family calls ‘Barbara’s question’ applies – “What are you going to do about it?”. If nothing, shut up; if something, get on with it (and shut up). I no longer, if I ever did, take part in pointless conversation. If I don’t ask you how you are, it is because I can see you are well or not. I will ask if I am uncertain, or if I know you have had an injury or illness, in which case the question will be asking how you feel about improvement or its lack – more a question of how you are coping with withdrawal of faculties. Those at PMC will remember the practised grunt for ‘meaningless noise as greeting’. In China, Ni Hao is perfect [‘you well’, not ‘you well?’, which would be ni hao ma? ]; it is short, perfunctory and accepted as a sufficient, proper, equivalent to ‘hello’. I have been disappointed in my last several visits to Britain at the level of complaint and complaining. Wingeing Poms, indeed. If as a race this is a declaration of pleasure, of enjoyment at life’s little brickbats, then it is not appreciated. A recent mail from several sources passed me the delightful Daftland, copied in small font below. A tad political perhaps, but it’s end message is right, the Public (‘them’, or better, you) is who it is tacitly permitting such a state of affairs. I agree with Barbara (my mother); if you’re not going to do something about it, shut up. Or else they might break a Daft law. Means you’re free to do it again. You’d deny them their human right. And you'll end up in all sorts of strife. The whole thing has got out of hand. Will ever be caught and sent back. - they are not welcome here any more. Were the public who put up with it all. It’s my machine and my website; how dare you say I’m losing privileges! !